[dropcap size=”220%” bgcolor=”theme”]S[/dropcap]ShredSupply, Inc. has developed a retrofit solution for Shred-Tech control panels. Shred-Tech’s current design for its line of mobile document shredders incorporates hydraulic gauges and electronic switches mounted to a drop down panel. This panel tilts downward 90 degrees to allow for shredder operations in the field then tilts back up and locks for transport. The problem with this design is that over time the continual opening a closing of the operations panel puts stress on the hydraulic and electrical components. This causes pin hole leaks in the hoses and broken wire connections. It is not uncommon for an older MDS-25 to leak hydraulic fluid from behind this panel. At ShredSupply, we have seen this exact leak many, many times during our refurbishment process. Hydraulic leaks are not only minor nuisances, they can effect the bottom line. Leaks can increase the risk of slips and falls, can be flammable and can damage the environment. A major factor to consider is that leaks cause downtime. In this industry, having reliable, running equipment is only way to make money. A truck that is in the shop is not no longer an asset but a liability. To combat this problem ShredSupply has designed a retrofit control panel that eliminates the problems associated with the stock Shred-Tech® control panel. Our panel is hard mounted to the van body. It does not tilt, swivel or otherwise move and thus does not subject the hydraulic and electrical components to unnecessary wear and tear. This new design incorporates a sturdy welded aluminum frame and a door constructed of Shredfast’s MasterVault panel system. 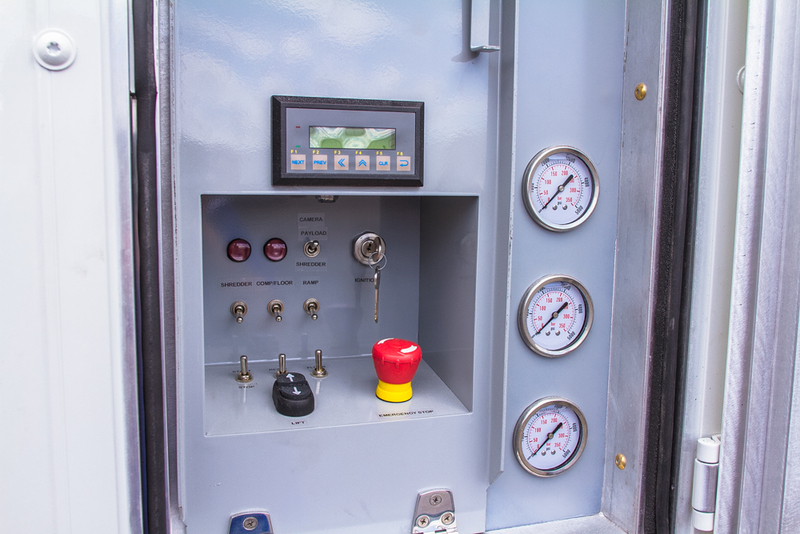 This new frame and door securely enclose the hydraulic gauges and electrical switches. It also replaces the stock electrical membrane switches with high quality toggle and momentary switches. This panel also has a new state-of-the-art kill switch which facilitates easier shutdown in an emergency. Increase the reliability of your Shred-Tech® shredding vehicle The retrofit process is straightforward, just call our service technicians at 866-520-8762 for more information or just email by clicking the button below. *ShredSupply, Inc. is not affiliated nor associated with nor endorsed by Shred-Tech® in any way.